In 2003, at the peak of the market, my parents proudly bought their first home. Several years later, after my parents finally decided to talk to me about some of their financial issues and were worried about losing the house, I had to step in. Like many borrowers of color, my parents were locked into an adjustable rate loan, with payments that ballooned three-fold over the course of five years. My father, ever since I was 14, has worked three jobs to provide for the family –– and he still was not earning enough money to pay for the loan. As resilient and determined as my parents are, they have made their monthly payments despite the huge financial headache the home eventually became for them. They had given up on the bank providing any alternatives, and after their experience with the nice Latina mortgage broker, they did not trust anyone. As the only child who went to college, I felt partly responsible for not being informed enough on homeownership to assist my parents in this process. But more importantly, why is this happening to families across the country? Could I (or we) have prevented this from happening in the first place? 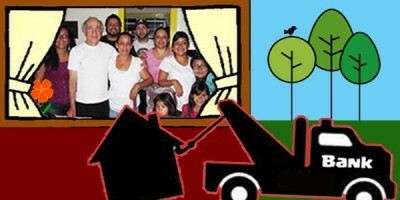 We gradually saw more and more families losing their homes in the neighborhood. When our neighbors next door defaulted on their home of nearly 20 years, my parents were afraid that they were next. Eventually my parents opened up their vault (more like mountain) of documents related to the home loan. The changes in the names of the lenders who were responsible for my parents’ loan was the first red flag—Wachovia (bought out by Wells Fargo), Countrywide (we all know what happened to them), and now, Bank of America. I didn’t know where to start, but I finally understood why my parents had stacks of unopened letters from the bank. Over the next four years, my father’s three jobs finally took a toll on his health, but my mother’s earnings were not enough allow him to quit at least one job, let alone pay for the mortgage. After many grueling phone calls between us and the bank(s); sifting through countless letters with my father; and attending a 10-hour session on loan modification that went nowhere, we were ready to give up. Family and friends kept advising my parents to just walk away from the home. Yet my father refused to do that, even though he had completely lost hope on getting any help from the bank. This was our home. It was personal. My biggest fear was that the home he was so proud of purchasing was going to kill him. In 2009, the Obama administration launched the Making Homes Affordable Program (MHA). The program, part of Home Affordable Modification Program (HAMP) funded by Troubled Asset Relief Program (TARP), aka the “bank bailout,” optimistically expected to modify 3 to 4 million homes. Homeowners are required to submit copies of pay stubs, assets, and copies of credit card and utility bills. Based on proof of income, assets, and debt, the bank is expected to determine an appropriate amount for monthly payment. Degrees of severity obviously vary, as there are borrowers who have already defaulted on their loans, or folks like my parents, who are at the brink of defaulting. The program has had very mixed results, to say the least. One key flaw is that the Treasury has no authority to compel banks to modify loans. The program has fallen far below expectations –– it has only provided relief for a small fraction of the projected beneficiaries. In fact, the program is at risk of elimination in efforts to close the federal deficit. Banks are continuing to drag their feet on making loan modifications permanent (let alone temporary), and “lost” paperwork is becoming more and more commonplace causing families to lose their homes. When my parents first heard about it, the first thing my father said was “Yeah, that program is probably not meant for people like us.” A year later, my parents received a package in the mail from Bank of America, containing an application for the MHA program and a letter indicating that they may be eligible for a loan modification. The “may” part made my father skeptical, and he stashed the package in his mountain of papers for no one to see. A second, third, and then fourth package with similar information arrived in the mail over the following weeks. I finally convinced my father that this was a “sign” that we should at the very least attempt to apply for a loan modification. Over Christmas last year, my father was diagnosed with glaucoma and we were told that his vision would get progressively worse. It had been almost three months, we still had not heard from the bank in nearly three months, and we were very concerned that my father would be forced into early retirement, resulting in the inevitable—losing our home. When I called Bank of America to let them know about my father’s illness and ask about the status of their application, I was told that it had been put on hold because of a missing document. Apparently, a missing copy of a water bill had been holding up the process for three months, yet the bank neglected to inform my parents. After promptly faxing a copy of the utility bill, we have continued to wait. And wait. And wait some more. Five months later, we are still waiting, and despite their frustration, my father continues to pay his insanely high monthly payment. We were informed last week that the bank will soon make a decision on whether they will be able to obtain a temporary payment reduction, which may or may not become permanent. In the meantime, we’re making the best out of preserving memories in the Cornejo compound…. A report released in 2010 by the Center for Responsible Lending estimates that for every 10,000 foreclosures, 790 and 769 of those foreclosures were to African-American and Latino borrowers, respectively, in comparison to 452 for white borrowers. And while Whites represent the majority of at risk-borrowers, African-American and Latino borrowers are more likely to be at risk of foreclosure (21.6% and 21.4% respectively) than White borrowers (14.8%). Colorlines‘ has produced a great infographic highlighting the severity of the crisis and its racial disparities. sorry about what’s happening it seems to be happening to all of us. The same reason bank of America treats their customers me being one of them…plus my business bank…which I will discontinue all my accounts with them and speak bad about….everyone I know is losing their home to the banks..going to rent not caring about ownership. This experience has definitely made me reflect on whether ownership will be an option for people in my generation, considering what is happening to many of my people’s parents.